Don’t let the picture deceive you…these were both badly delaminating despite multiple coats of marine varnish, and I had enough wooden splinters jammed into my ankles and calves to last me a lifetime. It was time for a replacement, but with what? I had fantasized about getting a sheet-metal place make me a pair out of aluminum diamond plate, until I started pricing the raw materials and cost of fabrication. Holy crap, that was no good…a few hundred dollars?!? 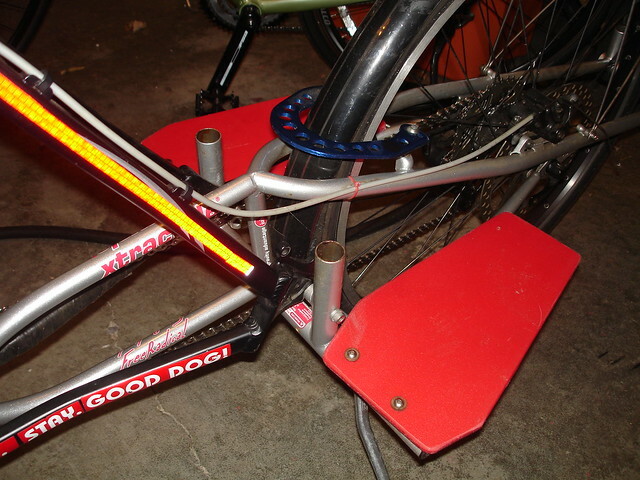 Then, I thought I might just replace them with another set directly from Xtracycle…but I don’t make a lot of money and a replacement set was (to me) absurdly expensive. 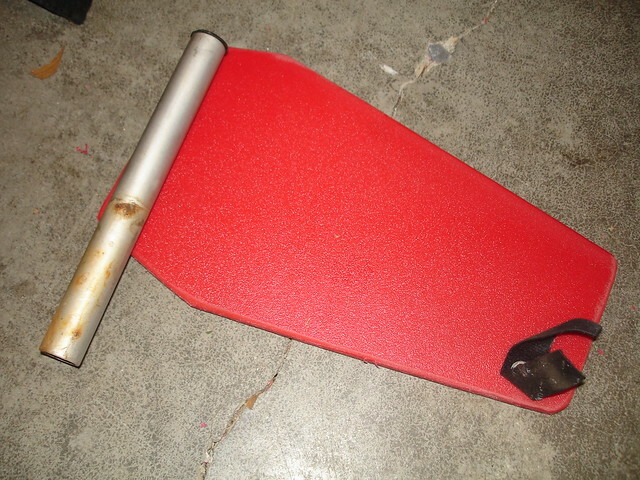 Besides, I was hoping Xtra had started making their footsies out of the excellent recycled plastic material their decks were available in, but alas…only wooden ones are available. 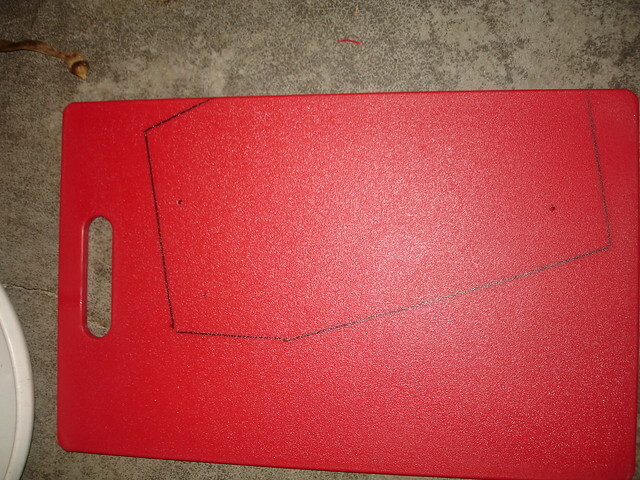 I had all the tools I needed, so the total cost for me was an hour of labor and less than $10.00 for the cutting boards. Win-win, babies!!! To find these tools I’d recommend checking with Consumer Reports or some of the many other sites on these topics. 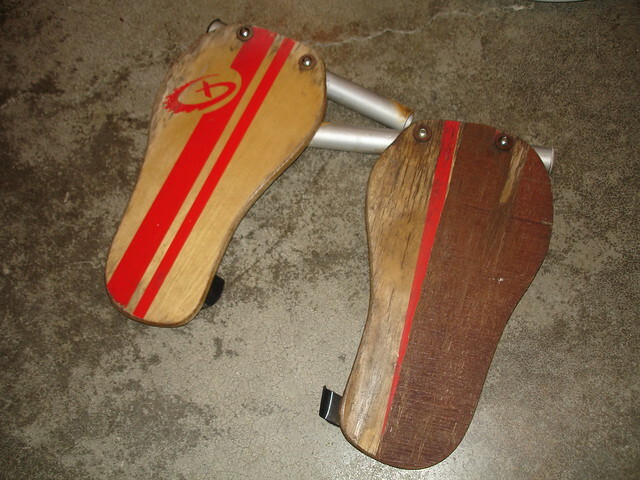 Don’t forget to mark the holes for the hardware — I reused the bolts and support tubes from my existing footsies which saved me some additional money. With the razor blade, scrape off the excess “flashing” from the cut edges…a power saw will sort of melt its way through the plastic material and leave a lot of fuzz on the edges. 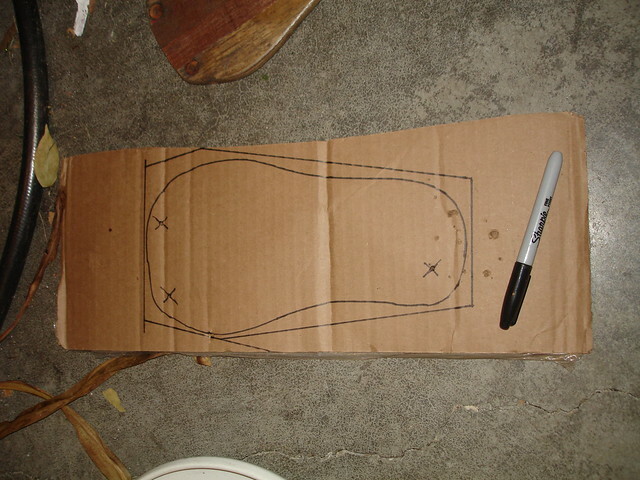 Next, sand the edges and corners…I put a gentle radius on all the edges and rounded off the corners so they wouldn’t dig into my or my passenger’s legs. Now all you have to do is install into the ports on the Freeradical frame and go about your business! 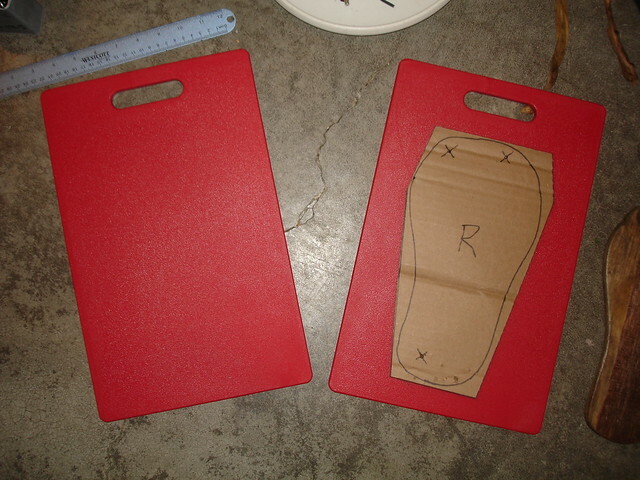 The cutting board material is about the same thickness as the stock wooden footsies, but it flexes a little bit. That’s ok, because my passenger is fairly light. If you were so inclined, you could cut a double thickness of cutting boards and sandwich them together with longer bolts, or find some other way to reinforce them from below (with aluminum strip stock or the like). The cutting boards come with a non-slip surface, so no additional grip tape is needed. And, these boards are strong enough to go through a dishwasher, so rain, salt and snow will be no problem for them. They’re maintenance free, and they add a little bit of colorful dazzle to the back end of my cargo-hauling beast! 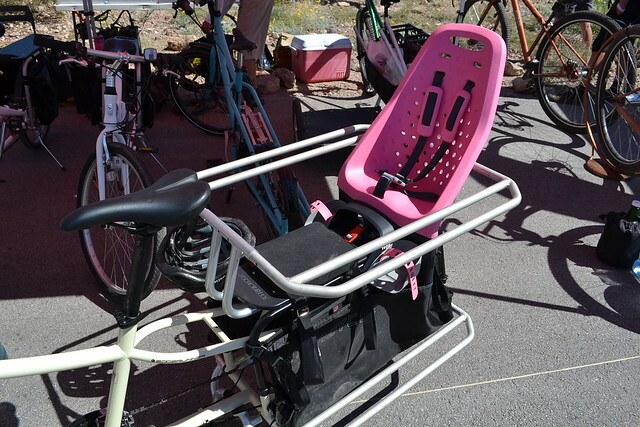 We’ve got a handful of other DIY Xtracycle projects in our archive, and we are always eager to hear about projects our readers have come up with. If you are in the sharing mood, just drop your project ideas in the comments below. On the 7th of September 2011 at 5:30 PM, a city bus hit me while I was riding my bicycle. 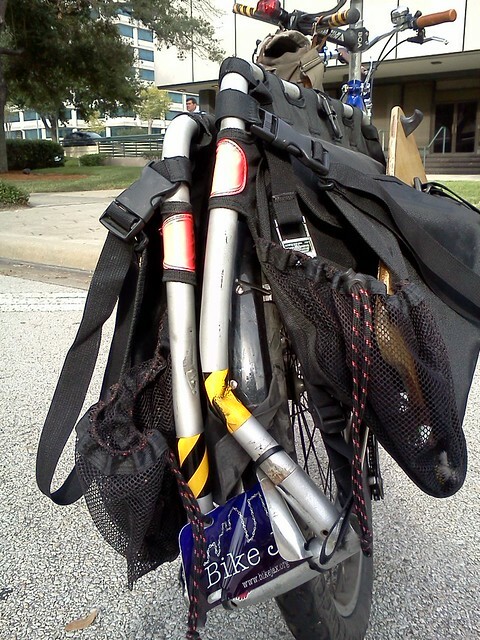 I was riding my Xtracycle to a North Florida Transportation Planning Organizaton meeting. Eastbound, I was riding on Riverside Ave. A Jacksonville Transit Authority bus was behind me. The city bus tried to pass me within inches and side-swiped me. If the bus was going to pass me, it had to give me at least 3 feet from the side of the bus during the pass. This is the law. This law is meant to protect me. But the bus driver failed to follow the law. The bus driver failed to be safe. I was thrown off my bike. The bike fell. The rear wheels of the bus ran over the bike. As I picked myself up with pain in my lower-back and hip area and a bloody elbow, I noticed that the bus had stopped. As I hobbled towards the bus, the door opened. The driver said, “Rescue is coming. I called everyone.” As it turns out, he had called only his supervisor who called Rescue. When the police arrived on the scene with Fire Rescue, I gave them my story. The bus driver was not truthful. He tried to blame me. He gave them a different story, something like him going along merrily and me swerving into the bus hitting him. The city busses are equipped with cameras. Upon hearing from me what happened and viewing the video, the police officer assigned blame to the bus driver. The police officer disregarded the bus driver’s excuse for causing the crash. At the same time, the police officer did not ticket the bus driver for violating the 3 foot passing law. I worry that most police officers don’t even know about the law. Rescue escorted me to the hospital close by. The pains in my hip area were excruciating. My left knee was swelling up and my left foot was aching. After a bucket-load of x-rays, the doctor announced that he could not find anything broken. He wrote me a prescription for pain killers and sent me home. Recovery has been slow. Between swellings, sore-points, ice packs and pain killers, I can only find relief in the fact that this could have been a lot worse. I am currently seeing a specialist about the residual pains that show no signs of going away three weeks after the accident. 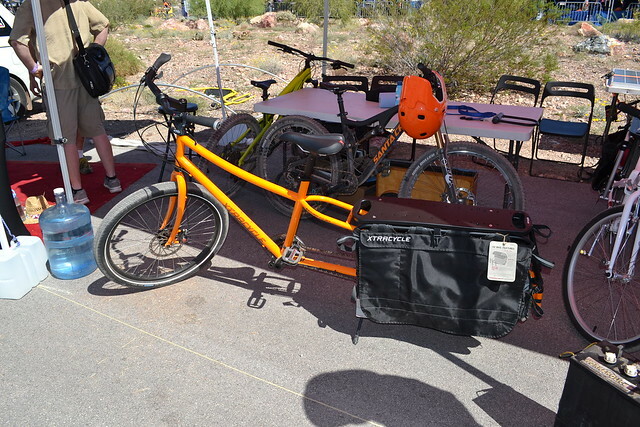 The Xtracycle had a worse fate. 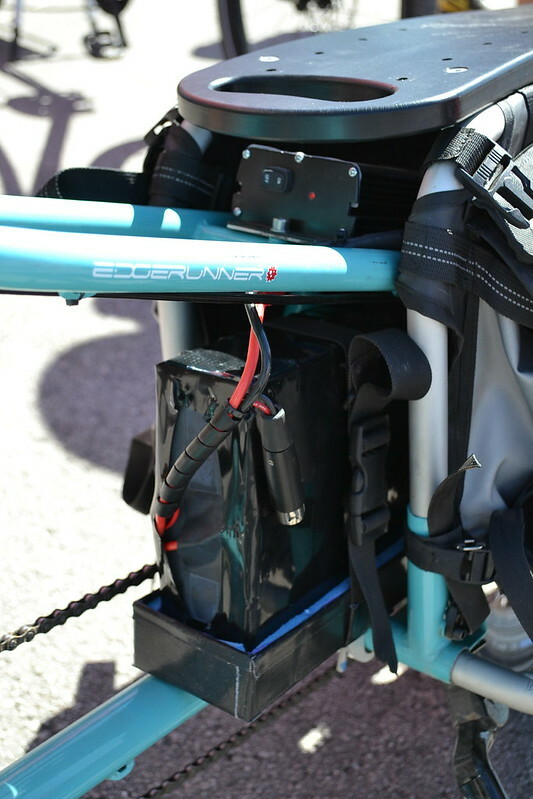 It was built as a freeradical attached to a steel-framed Specialized Rockhopper. The bus ran over the freeradical and crumpled the frame which in turn twisted the rear triangle of the bike. The entire bike is totaled. My attorney, Chris Burns, an avid cyclist himself, insisted that the JTA replace my bicycle. 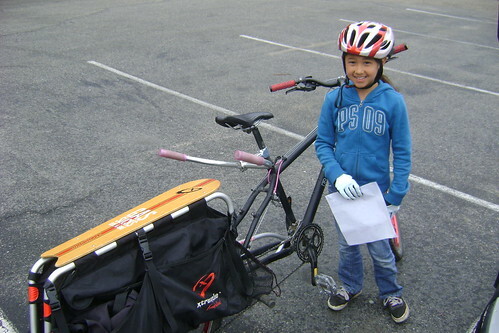 They have given me a check for a new Xtracycle. It is a tremendous benefit to have an attorney on your side who is more than familiar with bicycling law. It is frustrating that I was hit when I was riding safely and legally and correctly. 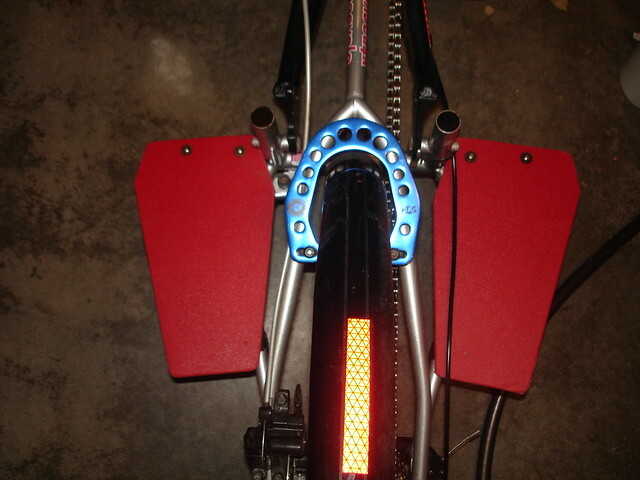 I have been advocating for bicycles as transportation for over four years and I am intimately familiar with the law. I stop at every stop light and stop sign, even when riding in a group. I have always maintained that the law is insufficient to protect cyclists and the enforcement of the law is often lazy. It is a mere thin blanket of laws which allows bicycles on the road but fails to protect cyclists adequately. Most bicyclists own cars and/or property and are tax paying members of community. I am sure there is a lack of education to motorists about bicycle laws and better educated motorists may be more alert and accommodating on the road. On the other hand, education does not stop motorists from crashing into each other either. September JTA Accident from Abhishek Mukherjee on Vimeo. Matt Uhrig of Bike Jax has an excellent “companion article” that offers more detail and commentary. Take a look at it by clicking here. I will offer my own brief commentary, however; not on this incident but on the 3-Foot Law on Florida’s books. As good as this law is on paper, it is incredibly difficult to enforce. And, I am convinced that not enough people (including motorists, many cyclists, and law enforcement officials) are aware of the requirement to give a safe 3-foot passing “buffer” to cyclists on the roads. As you can read from Shek’s account, even though there was clear evidence of a violation of this 3-Foot Law, the bus driver wasn’t charged with that violation. Ironically, JTA buses have been running a “3-Foot Law Awareness Campaign” since 2008, when the law went into effect. On our sister site, MtnBikeRiders.com, we posted an article asking our readers what bicycle related item(s) are they not willing to part with. There was a good 1.5 year time period in which I didn’t use my Xtracycle. So I had considered selling it. But on the advice of my wife and Moe, I decided to keep it. What about you, what are you not willing to part with? Is it a classic road bike? Or a bike you had in College? Share your thoughts! I took a day off from work and decided that I can spend a good portion of my morning pretending to be a tourist. I live in Fullerton, Ca. and apparently we have a bit of history in this place. 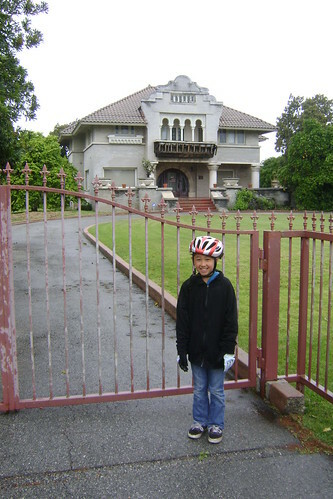 The city’s website lists about 16 historical buildings that my daugther and I wanted to hit up. 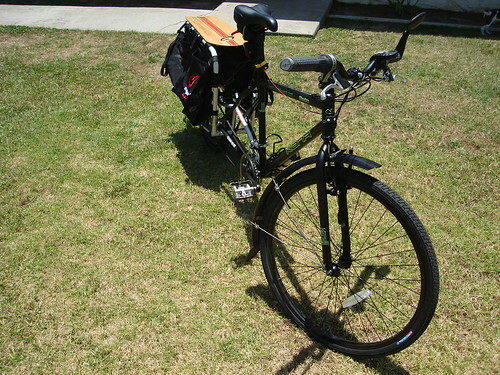 I printed out a map and packed some water and a few snacks, then we got out my trusty Xtracycle. We then loaded up the bags and headed out for our adventure. When we started our ride, a bit of drizzle was kissing our faces as we rode. But by the time we got to our first stop, the rain was starting to come down pretty good. Our first stop was Hillcrest Park. As long as I’ve lived in my city, this was my 3rd trip to the park. 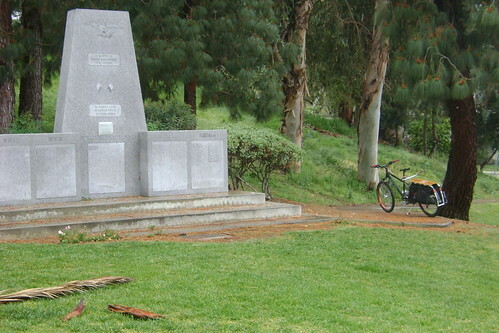 There are many points of entry to Hillcrest and the side we rolled up on had a memorial for fallen soldiers who lived in Fullerton. 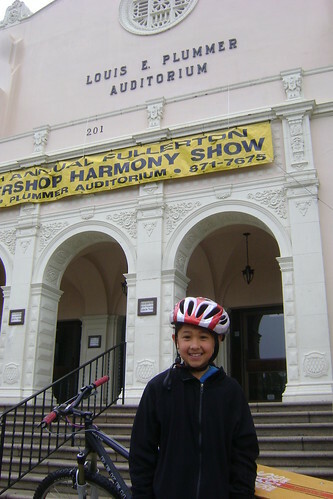 We then rode to Hetebrink House and the Plummer Auditorium. The rain wasn’t letting up, and we saw a car accident happen right in front of us. For some odd reason, Californians don’t know how to drive their cars in the rain. Our next stop was an old church building still used for service today. It was built in 1909. 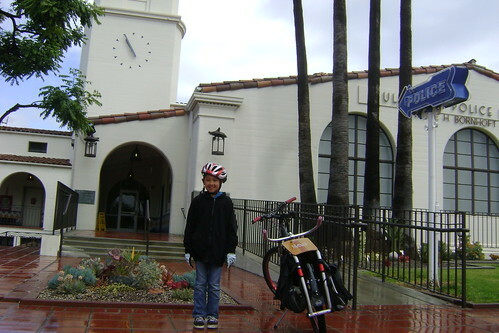 Fullerton has an old train station that Metrolink and Amtrak stops at. The Union Depot is now a Spaghetti Factory restaurant. It was encouraging to see that the station had at least 10 bike lockers being used. Then we headed to a place called the Elephant Packing House. Just the name alone got us curious to see what it was. I’m sure my daughter thought that’s where they packed Elephants…well I actually thought of that too. But we came to find out it was a packing house for an old brand called Elephant Orchard, a citrus grower and exporter. Apparently Fullerton has a long history of Orange groves in which the city was known for its awesome Valencia oranges. However, the Elephant Packing House is now home to a billiards dealer. Our tenth stop was the Fullerton Police Dept. This building used to be City Hall from 1942-1963. Since then the PD has called it home. 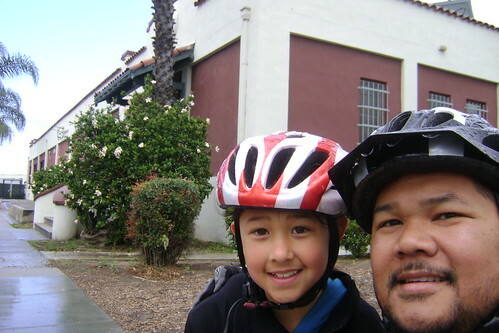 The Tour of Fullerton (our own version) took us about 2 hours to do on bike. My daughter had a great time learning and seeing all the great buildings that make our city an interesting place to live in. If you ever get a chance, I’d suggest you do the same for your own town. Who knows what you’ll see and learn!